The Walking Dead presents a compelling story, but is the gameplay still too complex? I was having a leisurely pint of ale with my girlfriend when my mind began to wander away from our conversation. What ever we were talking about evidently paled in comparison to my thoughts on the Walking Dead game, the third episode of which I had played through a couple of nights before. When she ultimately realized that I was not giving her my full attention, I tried to explain why the game touched me so deeply. I found it almost impossible to justify my feelings without speaking about it in “gaming terms” and by comparing it to other games (two things I know she doesn't understand and finds difficult to relate to). I took a moment to compose myself and tried again, this time with the non-linear narrative and the implications it has for character development. I started from the beginning, telling her about the player character, Lee, and how we are shown that he is going to jail at the opening of the game. Besides this, we know nothing about the character and are still expected to speak for him, which shapes our version of him from the very start. I find this a fascinating way of opening a decision-based narrative. Does the player embrace the ambiguous criminality that has been set at their feet, using it to justify immoral actions that their version of Lee may perform? Alternatively, do they attempt to right these unknown wrongs with their own intervention, repenting for what could be a minor indiscretion by way of noble altruism? This brought us to the question: Would she care to take part in this fascinating exploration of human morality? Being a psychologist, I imagined that the good woman sitting next to me would find this divergence of choice fascinating. She had bemoaned my short-sightedness when “researching” SimCity Social and directed me to a more scientific opinion of the game. I therefore assumed she would surely find something to dig her teeth into with this, and even possibly consider playing it herself. Although her interest was peaked, we were still ultimately talking about games, so I’d have to work harder to convince her of The Walking Dead’s narrative merits. It hadn’t helped that I’d recently been talking about Borderlands and its gleeful embrace of cartoon violence over emotional substance, though it just made the endeavor that more meaningful. Not all games are striving for the same audience reaction, after all. Next on the agenda was Clementine, a young girl Lee is charged with accompanying. His task is twofold: protect the youngster from the cruelties of a humanity unhinged and attempt to find her missing parents. Early in the game, you happen upon her deserted home and discover through voicemail messages that they were vacationing when the zombies attacked. Their likelihood of survival is slim, though it is up to the player to decide how realistic Lee wishes to be about this with Clementine. I began by being quietly optimistic with her so as not to break her heart so early on in the relationship. After a couple of hours though, I found it increasingly difficult to be anything but supportive of her insistence to find them. I cared for her too much. I had, as I always do, followed the noble path. Mass Effect, Fable, and Fallout 3 are all games in which I inevitably played as if I were me. Proof that role-playing is still very much alive in gaming, yes, but also a testament to my inability to separate myself from a gaming avatar. However, The Walking Dead has, in Clementine, an even deeper moral hook in me. Throughout all of the choices Lee is given, I am not simply following my blind morality, I am also making my decisions based upon what Clementine would want. Should I let my sense of anger or vengeance win out as it has in past gaming experiences? 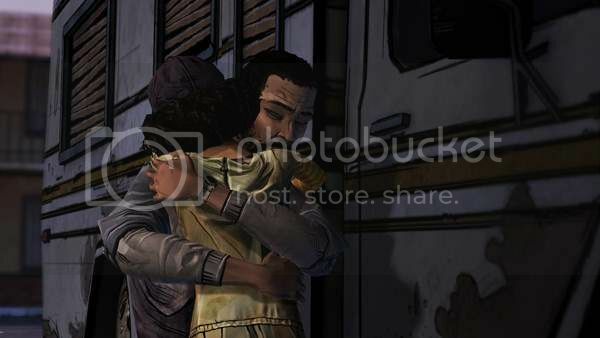 No, I have to remove myself and think of Lee and more importantly Clementine’s relationship with him. She will witness such a lack of self-control and remember him for it, and I don’t want to be held accountable for that. My girlfriend initially said yes to playing The Walking Dead, though we have still yet to sit down together and begin our journey across a decimated Georgia. Like all game-related discussions we have, the actual act of playing proves to be the barrier to entry, not the content behind it. Discussing the implications of player choice with her proves fascinating. Her psychological viewpoint far surpasses my own, but the idea of her sitting and playing a game still proves to be an obstacle. She can’t separate the mechanics and her fear of not being able to competently interact with them from the game that sits on top. While the controls in The Walking Dead are very simple, their unfamiliarity still intimidates her. It harbors one of the greatest and most emotionally resonant narratives I have ever experienced within a game. It is a shame that some (like my girlfriend) will miss out on this fantastic examination of the human condition pushed to its limits simply by virtue of it being game.